Hiya guys! If you haven't been able to tell, I've been yearning so badly for Fall this week. I always like skipping to the season and being done with it, you know what I mean? It's like okay Fall so give me leaves, pumpkin spiced lattes, and dark vamp shades. Pretty much I always forget the nice transitional stage, especially when it comes to polishes. With that in mind, today I'm sharing the Summer in the Backyard Trio by Poetry Cowgirl Nail Polish. And I know what you're thinking "Summer?! ", yes this is a late summer release. But the trio actually acts like the perfect transitional set, let's go ahead and take a look at the shades. The Summer in the Backyard Trio by Poetry Cowgirl Nail Polish will be releasing Friday, August 26th 12PM EST. Each full-size bottle (15 mL) will retail for $10 and the entire trio set will be $27. Each mini-size bottle (8 mL) will retail for $6 and the mini-size trio will be $16. Old Wooden Fence can be described as a greyed-out taupe with grey and bronze micro-flakies and the slightest hint of green shimmer. Isn't this so dreamy?! The shimmer really brings this one to life for me and those flakies are the perfect touch. It's also such a unique shade as well, I really didn't have anything quite like this tone in my collection beforehand. The formula has a really nice smooth consistency, not too thick or too thin. Very easy to layer for an opaque finish. Shown here in two coats and sealed with a glossy topcoat. St. Augustine Grass can be described as a medium green with black micro glitters, green and gold sparkles, and grey micro-flakies. Normally I'm not a fan of greens, but this one felt irresistible. 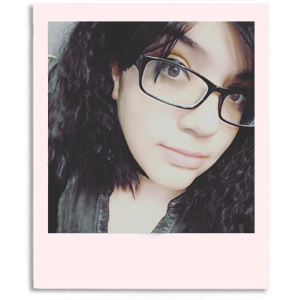 And surprisingly complimented my skin tone really well. The formula has a nice opaque consistency and smooth application. It ends up drying to a bit of a gritty finish, but it smooths down perfectly with double topcoat. Shown here in two coats and sealed with a glossy topcoat. In the Pool can be described as a vibrant light blue filled with purple and gold sparkles and rainbow micro-flakies. Doesn't this make you feel like you're looking into a glistening pool?! I wish this one in particular would have been released a little earlier in the summer it's so gorgeous. The formula is a little bit on the sheer side, but it does layer well for an opaque finish. Shown here in three coats and sealed with a glossy topcoat. Overall I think the shades are perfect for easing us out of Summer mode. These fill in that transitional period perfectly, while feeling like they are very wearable year round. 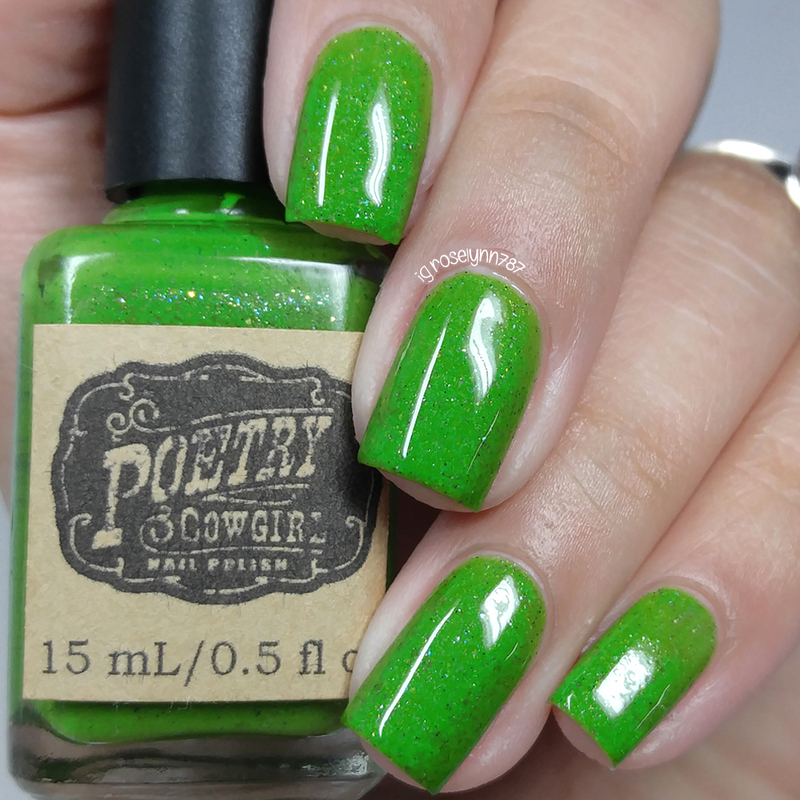 As with my experience with Poetry Cowgirl Nail Polish in the past, the formulas are great throughout this collection. I cannot recommend Old Wooden Fence enough, it's such a beautiful and unique shade. Definitely has my vote as must-have among the three. But what do you guys think, which one is your favorite? To recap, the Summer in the Backyard Trio by Poetry Cowgirl Nail Polish will be releasing Friday, August 26th 12PM EST. Each full-size bottle (15 mL) will retail for $10 and the entire trio set will be $27. Each mini-size bottle (8 mL) will retail for $6 and the mini-size trio will be $16. Your nails are so perfect! I love Old Wooden Fence, perfect for fall! Wow, what beautiful nail polishes <3 I really like all of them!